There will be over 20,000 participants at the event. Due to the large crowds and the race course, the Miami Police Department will close the roads that make up the race route beginning at 5:00 AM Saturday morning. Expect delays and detours and plan to arrive early. NO HANDBAGS OR BOOKBAGS WILL BE ALLOWED AT THE RACE. PLEASE LEAVE THESE ITEMS IN YOUR VEHICLE OR AT HOME. Due to road closures, detours, the expected crowd of 20,000, please allow extra time when driving. Park at Bayside Parking Garage on Race morning for $4.00 (must be in by 8:00 AM and out by noon). 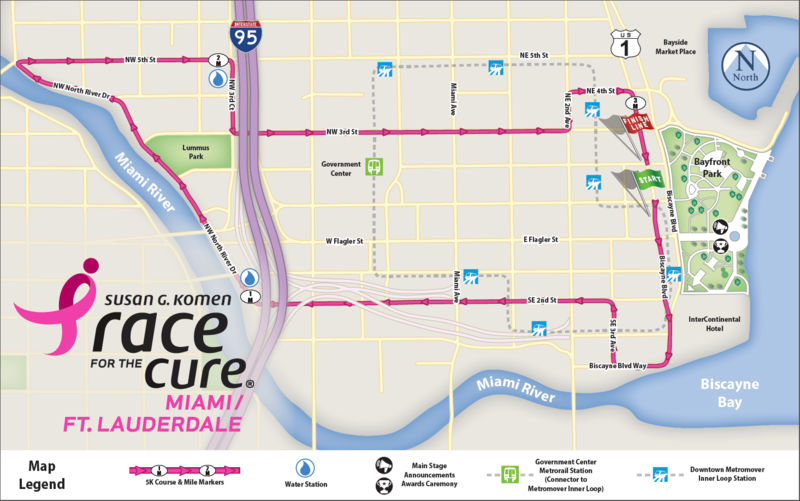 Bayside Parking will donate $1.00 per car to Komen Miami/Ft. Lauderdale. Other lots will also be open around the area but prices do vary.